The FBI recently announced that 9 Baltimore County residents and two New Yorkers have been indicted on federal drug and conspiracy to traffic contraband cigarette charges. The contraband cigarette allegations are definitely not part of your run of the mill federal criminal case. But just because cigarettes are legal does not mean they can’t be the subject of a highly profitable scam. In fact, the FBI alleged that the illegal tobacco trafficking ring netted upwards of 6 million dollars for the co-conspirators. All but one of the defendants face up to five years for the tobacco charges, and some were also indicted on charges for conspiracy to traffic oxycodone and money laundering. The scam was highly profitable for an extended period of time, but like most theft schemes, it all came crashing down as the defendant’s became too profit hungry and dead set on raking in large amounts of cash. The indictment came back from the grand jury last week, and was unsealed yesterday after the arrest of 8 defendants, and the execution of 12 search warrants. Contained within the indictment are the details of just how the Pikesville and Owings Mills residents teamed up with two New Yorkers to carry out their scam. The basic premise of the contraband cigarette conspiracy is that New York has an exorbitantly high state cigarette tax, which exceeds 4 dollars per pack and 40 dollars per carton. In contrast, Maryland taxes cigarettes at much lower rate. In fact, the Maryland rate is less than half that of New York. It is alleged in the indictment that some of the defendants operate businesses, including pharmacies, in the Baltimore area, and through theses businesses would purchases large amounts of cigarettes. Most of these cigarettes were not sold in the local businesses, but rather stored in the homes of the defendants, and transported to New York where they were sold for larger profits. 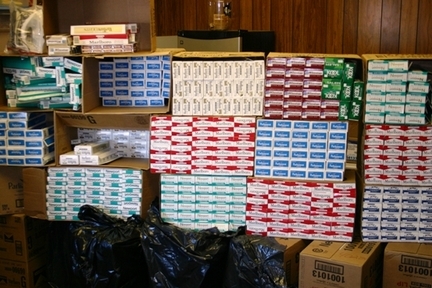 While conducting the investigation into the tobacco scam, law enforcement officials uncovered additional alleged criminal activity including the sale of drugs yet not approved by the FDA, distribution of narcotic painkillers, dispensing prescription drugs without a prescription, and money laundering. Six of the defendants appeared yesterday in the United States District Court in Baltimore, and two others appeared in federal court in New York. It seems that most if not all of the defendants are headed toward plea agreements, but it will likely take months before all the details are hammered out. As per the norm, the first defendants to cooperate will likely receive the best deals from the U.S. Attorney’s Office. The investigation was predominately carried out by the FBI, but multiple law enforcement and government agencies actually corroborated to carry out the bust. These agencies include the U.S. Food and Drug Administration Office of Criminal Investigations and the Department of Health and Human Services. Last but not least the Baltimore County Police Department played a large role in building the case that the U.S. Attorney’s Office will now prosecute. Benjamin Herbst is a Maryland theft attorney, who handles all criminal charges in both state and federal court. Contact Benjamin anytime for a free consultation about your case.